Parts of plants used as medicine are the bark, root bark, fruit, and leaves. Use materials that have been dried or fresh. Bark after washing, then dry in the sun until dry. Perform Cutting prior to storage. - External use for scabies and fungus on the scalp (tinea capitis). - Stomach pain, stomach pain. Bark and root bark contains toosendanin (C30H38O11) and components yang.larut (C30H40O12). In addition, there are also alkaloids azaridine (margosina), kaempferol, resins, tannins, n-triacontane, ß-sitosterol, and triterpene kulinone. Less toxic than the root bark bark. 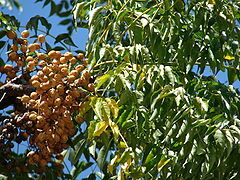 Seeds contain a very berracun resin, 60% fatty oil consisting of stearic acid, palmitic, oleic, linoleic, lauric, valerianat, butyrate, and a small amount of essential oil of sulfur. Fruits contain sterols, catechol, vanilat acid, and acid bakayanat. 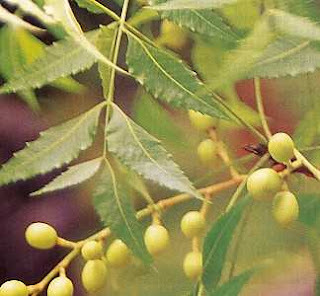 The leaves contain alkaloids paraisina, routine flavonoids, bitter substances, saponins, tannins, steroida, and kaempferol.